Some of these food holidays are downright nutty. Take, for instance, today: it’s National Almond Day! Actually, I should strike that joke from the blog, because it turns out almonds aren’t true nuts at all – they are actually a fruit, more closely related to cherries and plums than to cashews or walnuts. The almond “nut” is the seed of the green, fleshy fruit. I guess the folks at Almond Joy never got the memo; their candy bar slogan – “Almond Joy’s got nuts, Mounds don’t” – is just plain wrong (not to mention grammatically clunky to begin with). In truth, Almond Joy’s got fruit, Mounds don’t. Almonds are native to the Middle East, where they grew like weeds in the lands around the Mediterranean Sea, and were one of the first trees domesticated by man. Most ancient civilizations relied on almonds as a food source; they date back to 4000 B.C. They are mentioned numerous times in the Bible, where they were revered as symbols of divine approval and hope. The Book of Genesis calls almonds “among the best of fruits,” and almond branches were a symbol of the virgin birth of Jesus. In fact, many paintings depict almonds circling the baby Jesus (though it could be that the artists had merely worked up hearty appetites while slapping oil on canvas). King Tut was buried with several handfuls of almonds when he died, in order to nourish him on his journey to the afterlife. I’d have preferred a pizza myself, but maybe all their Round Tables were closed for the night. Cultivated almonds are delicious and nutritious, but wild almonds are another story. Their kernels contain prussic acid, a fancy name for cyanide, and are deadly if eaten raw. Domesticated almonds are safe due to a genetic mutation that eliminated the toxic substance.Today, nearly 80% of all almonds in the world are grown in California. Earlier attempts to grow the fruit in southern states were unsuccessful due to killing frosts and high humidity, but the Golden State’s climate proved to be ideal for these little suckers. 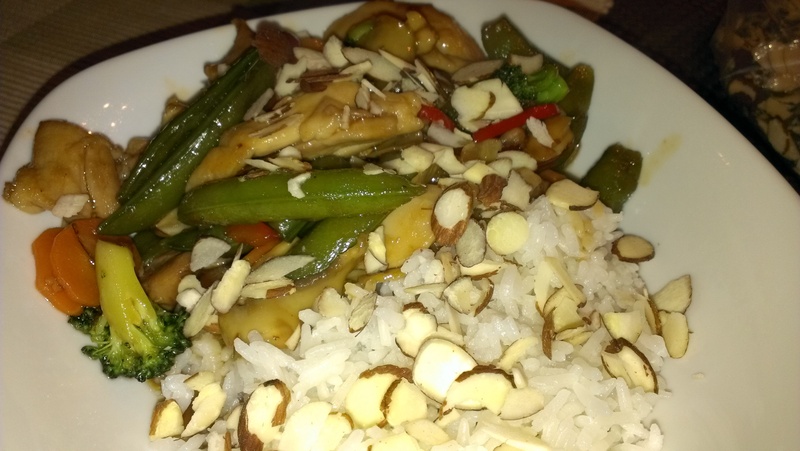 We could have just eaten a handful of almonds to celebrate today’s holiday, but it’s the weekend and we wanted to get creative, so we decided on a chicken teriyaki stir-fry topped with slivered almonds. It was a delicious combination!